of the National Centers for Environmental Prediction. TAMPA, Fla. -- Three graduate students from the Department of Geography at the University of South Florida recently presented their research at the National Weather Association annual conference held in Tucson, Ariz.
Ph.D. students David Roache and Charles Paxton, and master’s student Cristina Mazza showcased their meteorological research. Roache presented on the impact of interaction between the El Niño-Southern Oscillation and the Madden-Julian Oscillation on Eastern North Pacific tropical cyclone activity. Roache, who recently entered his second year of the doctoral program, already has a paper in press in the National Weather Digest and is co-author with his adviser Jennifer Collins, assistant professor in the Department of Geography. Paxton presented on the topic of the evolution of the atmosphere during extreme hail events over Central Florida. This research is done in collaboration with Collins and colleagues at the National Weather Service. Undergraduate student Nicole Weis from the Department of Communication also participated in the study. Collins and Paxton have previously published work on other severe weather events in Florida and their research results are used by meteorologists at the National Weather Service as their research identified precursor atmospheric conditions for the formation of southwest Florida tornadoes. 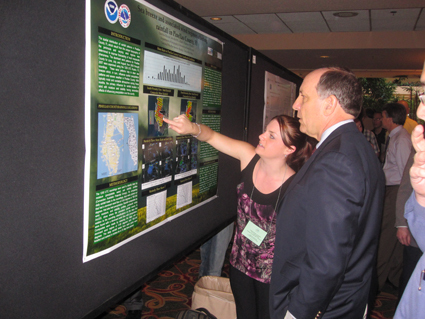 Mazza presented a poster on the spatial distribution of rainfall patterns in Pinellas County, Fla. This is work funded by a University Corporation for Atmospheric Research (UCAR) grant, which was awarded to Collins earlier this year. Mazza said was thrilled with her first conference experience. She said she got to meet Dr. Louis Uccellini, the Director of the National Centers for Environmental Prediction, who was particularly interested in the study. Another scientist, Mike Mogil was interested in duplicating the study for the Collier County region in Florida.